Mondays, 10 a.m. – 7 p.m.
Tuesdays, 9.30 a.m. – 5 p.m.
Wednesdays, 9.30a.m. – 1 p.m.
Thursdays and Fridays, 9.30a.m. 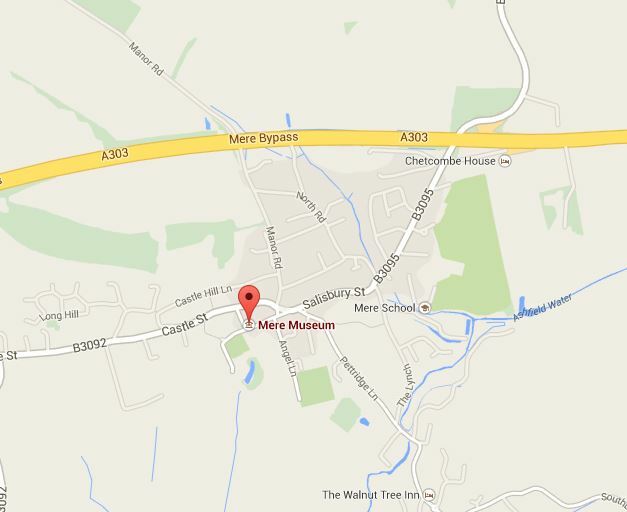 – 5 p.m.
Coming on the A303 from the east, take the turn-off to Mere on B3095 and follow the signs into the town centre. At the clock tower bear left into Church Street and the Library/Museum is about 100 yards along on the right hand side. Limited parking in Church Street. There is a free town car park nearby in Castle Street. If approaching from the west on the A303, take the turning off to Mere, B3092, and follow the signs into the town centre via Castle Street. At the clock tower turn right and right again into Church Street and the Library/Museum is on the right hand side.